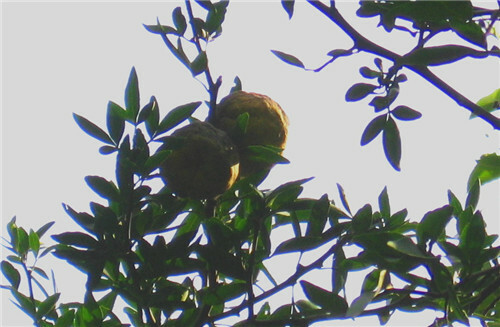 There are only two endemic species of Poncirus (Rutaceae) in China, P. trifoliate and P. polyandra. P. trifoliate was originated in central China. P. polyandra, which is endemic to Yunnan Province, was first found in Fumin County in 1984. It is a precious breeding germplasm resource of citrus as its fruits are a medical substitute of fructus aurantii, so it’s named as "Anti-tussive tree" by the locals. P. polyandra has been extinct in origin place and been listed as the “wild extinction species”. At present, there are only one cultivated plant near the village of the origin place, eight in Kunming Institute of Botany, Chinese Academy and Science (KIB), and ten in the plantation of Tea and Mulberry Station of Fumin Agriculture Bureau. KIB began the research of ex situ conservation of P. polyandra in 1993. Currently, Kunming Botanical Garden (KBG) has successfully conserved eight P. polyandra plants. Five plants have bloomed since 2008 and bore fruit in 2010.More than 30 fruits were harvested with only about 200 seeds in 2012. It is expected that the cultivation of the nursery-grown plants in 2013 for re-introduction and population reconstruction of P. polyandra. Copyright © 2002-2016 Kunming Institute of Botany, CAS All Rights Reserved.